With over 14 years experience in the industry, owner Ben Springer has the knowledge and the know how with water damage restoration and mold remediation as well as over 6 years of Cleanspace crawl space installation experience. Our mission is to provide the Hi-Line with exceptional waterproofing solutions through innovative products combined with hard work and integrity. Hi-Line Flood Solutions is your local Basement Systems® dealer in the Montana area. We serve Havre,Shelby, Cut Bank and many outlying areas, including Sunburst, Harlem, Malta, Chinook, Saco, Rudyard, Joplin and nearby. See our full service area. As basement waterproofers and crawl space repair experts, we are locally owned and operated contractors who have been in business since 2011. 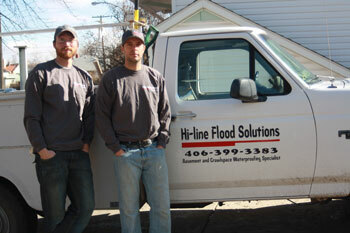 At Hi-Line Flood Solutions, we offer free, no-obligation waterproofing quotes to homeowners within our service area.